The Harvest Joy Mum Plant captures the rich colors and spirit of the fall season. 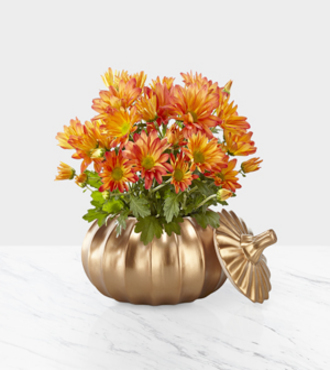 Placed in a shiny gold pumpkin container, this bursting orange mum plant has a plethora of vibrant flowers to brighten up anywhere its placed. Give this beautiful plant to remind someone just how much you care about them this autumn. Plant measures 4.5-inches in diameter. "Having the capability to place the order today for delivery tomorrow and reasonably priced selection, made my decision to place my order with you easy. Thank you." -- Reggie W.